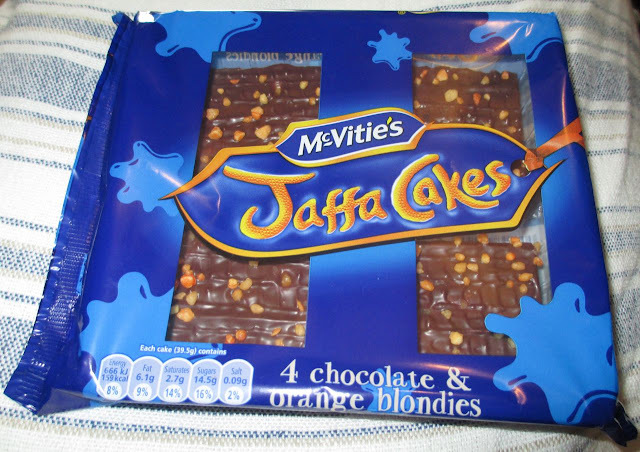 McVities do seem to be releasing a lovely selection of new goodies at the minute, the latest of which are these McVitites Jaffa Cakes Blondies. Blondies is a word that I’m not that used too, Brownies is far more familiar to me as a British person. Blondies being the same but without the added cocoa in the sponge. There are four of the Jaffa Cakes Blondies in the plastic tray and the first thing to note is that they are quite sticky. This makes getting them out of the tray a little bit difficult, but somehow I managed. 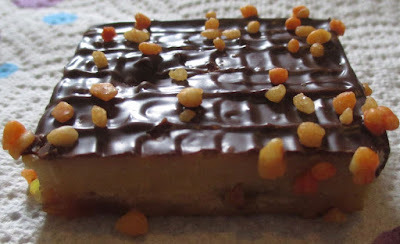 The cakes themselves are quite soft, and the texture is mixed up with the lovely addition of the slightly crunchy orange pieces on the top. The flavour is rather sweet, and the orange taste is lovely and strong, they have a fab zesty taste and the chocolate works well with them. I’d have liked a chocolate base too (brownie not blondie) but I understand why they went with the no chocolate version, it is to keep the likeness to a vanilla sponge based proper Jaffa Cake. These new McVitites Jaffa Cakes Blondies are a fun product, with a lovely burst of chocolate and orange. If the weather ever improves, these would be perfect for packing in a picnic.